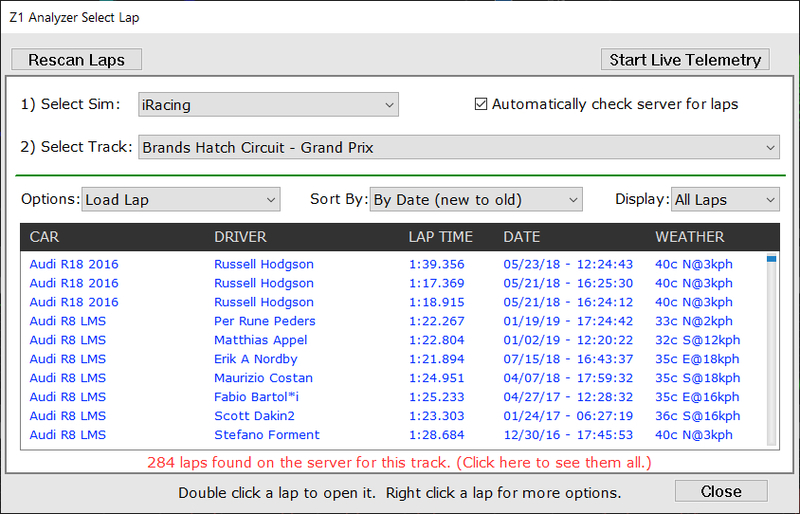 The Z1 Analyzer allows you to open any lap you have recorded on your simulator, or any lap that another user has uploaded to our servers. To view the list of available laps open the Select Lap dialog by clicking on the folder icon or choosing Open Laps from the File menu. The Select Lap dialog shows all available laps for the currently selected sim and track. Using the Sort By and Display drop downs you can specify how the laps should be displayed. For more options, right click on the displayed laps. The laps are color coded to show you which ones are yours (black), which are from other drivers on the server (blue), which ones are currently loaded in the Analyzer (the small square to the left of the car name), and which one you have currently selected (peach). You can customize these colors in the Color tab of the settings dialog.